The AX6638A/B/C is an efficient, precise dual-channel CMOS LDO regulator optimized for ultra-low-quiescent applications. Regulators output1 and output2 are capable of sourcing 700mA of output current. The regulators are stable with output capacitors as low as 1μF,including current limit, thermal shutdown protection, fast transient response, low dropout voltage, high output accuracy, current limiting protection, and high ripple rejection ratio. The AX6638A/B/C contains internal pull high enable function that allows the output of regulator to be turned off. 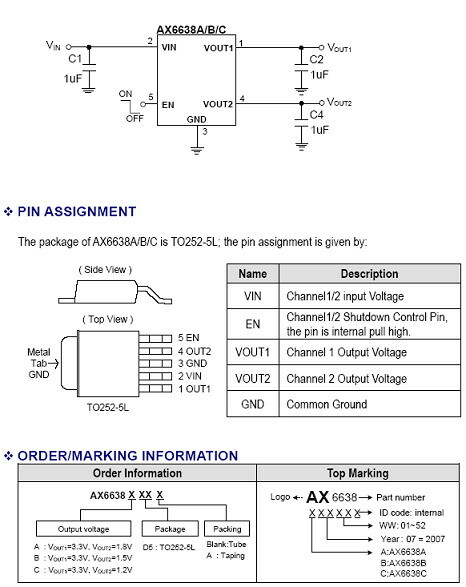 The AX6638A/B/C regulators are available in used TO252-5L Pb-Free package.